Welcome to Northwest Paramedical Industries for Fingerprinting services and DNA Testing, we make the process fast and easy! 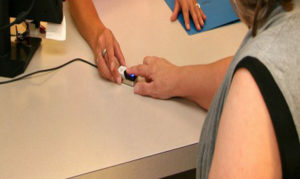 To schedule your Fingerprint ‘appointment’ you will need to go online to www.FieldprintUSA.com or call 877-614-4364, we are unable to schedule your appointment through our office. To schedule your DNA Testing ‘appointment’ you will need to go online to DNA North America or call 800-401-3602, we are unable to schedule your appointment through our office. Tests include Paternity, Maternity, Grandparentage, Twin Zygosity, Siblingship, Prenatal Paternity and more. Our office is located at 8285 SW Nimbus Ave, Suite 171, in Beaverton, just down the road from Washington Square Mall and accessible by Bus Lines #76 and #78. Please enter our building through the front entrance facing Hall Blvd… turn left to follow our hallway down to Suite 171 on your right. Q) Do I need an appointment? How do I make one? Q) How do I register and can you walk me through set up? Q) Can I pay at your location with cash or with a credit card? Q) How busy are you right now? Please call our office in Beaverton with any other questions you may have at 503-906-1830 or email us at reception@appsnw.com Thank you and we look forward to seeing you soon!